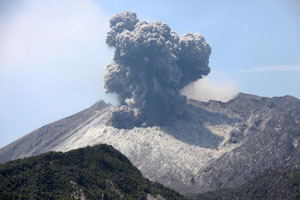 Sakurajima volcano is a geologically young stratovolcano consisting of two N-S aligned and adjoining edifaces, Kita-dake (1117 m) and Minami-dake (1040 m). Naka-dake (1069 m) is a lateral vent of Minami-dake and lies between the two main edifaces. Construction of the volcano is thought to have begun about 13,000 years ago at the southern perimeter of the Aira Caldera which formed as a result of a massive eruption approximately 22,000 years ago. "Old Kita-dake" was active shortly after the Aira Caldera eruption, becoming inactive about 20,000 years ago (Okuno et al. 1997. Nucl. Instr. Meth. Phys. Res. B 123, p.470-474). 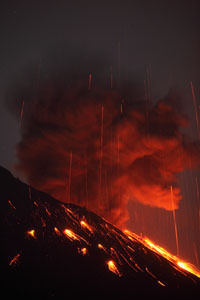 This was followed by the "Young Kita-dake" stage which involved several eruptions over the period from about 11,500 before present (BP) to 3500 BP. 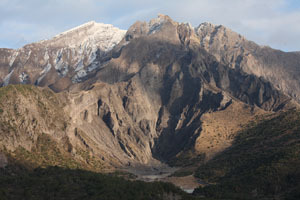 Since then, Kita-dake summit crater has been inactive, and numerous eruptions resulting in the construction of the Minami-dake ediface which partly overlies the south flank of Kita-dake. 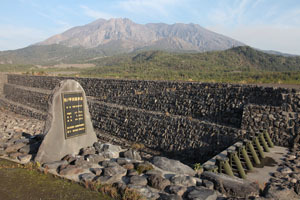 Historical activity has all been focussed at Minami-dake or vents on the flanks of both edifaces. Major historical eruptions occurred in 1471-76, 1779, 1914-15, and 1946. 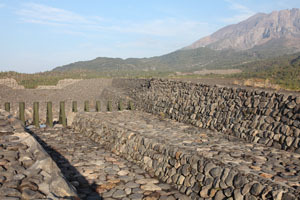 Each of these emplaced large andesitic lava flows which modified the coastline of Sakurajima, indeed connecting the SE corner of the former island to the Oosumi Peninsula in 1914. 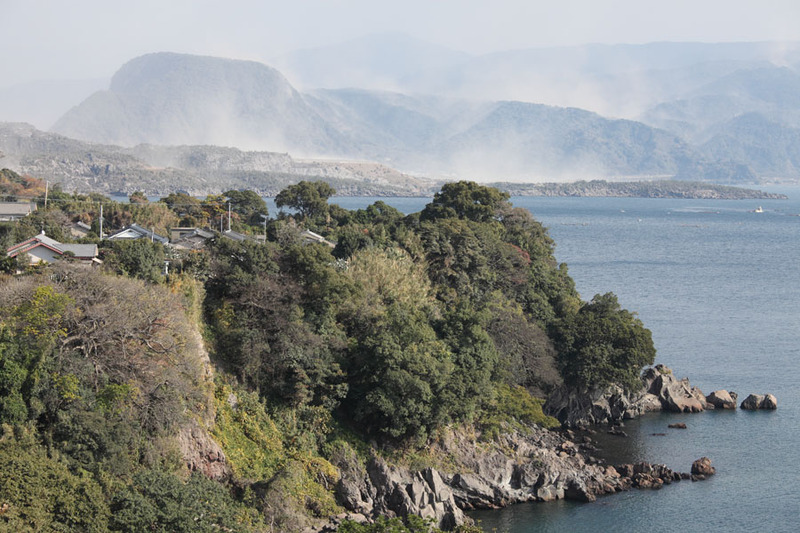 To the west, still separated by about 4 km of water, lies the major city of Kagoshima, which frequently suffers from ashfall from the volcano. Volcanism in the area can be attributed to the steep subduction of the Philippine Plate beneath the Eurasian plate. The frequently active Aso and Suwanosejima volcanoes are found about 200km to the north and south (in the Ryukyu Arc), respectively, and all are aligned approx. 120-250km from the plate boundary to their southeast. In 1955, Miname-dake summit crater(s) burst into life for the first time since historical records began. 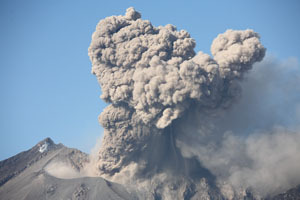 Contrasting with previous eruptions, which appear to have separated by lengthy periods of quiescence, activity since 1955 has been characterized by brief periods of ash emission and sporadic vulcanian explosions, with frequency and intensity fluctuating with time. The mid-1970s to mid-80s involved a period of heightened activity with numerous powerful events. Since then, activity declined, only to be on the increase again by 2009, with activity having largely shifted to the Showa crater. All eruption images herein document activity at this crater. 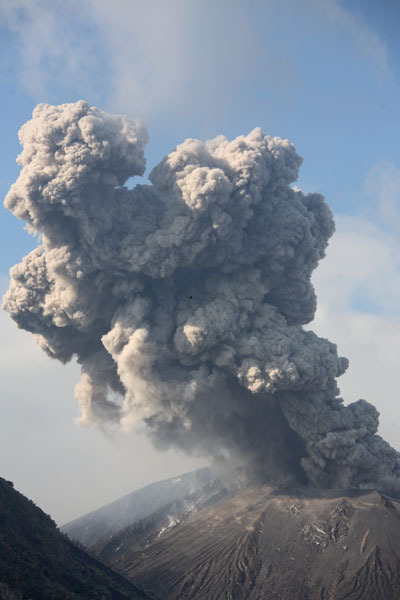 Showa crater had been inactive since the 1946 eruption, however it started to erupt ash on 04.06.06 and has increasingly become the focus of activity since then, with Vulcanian eruptions frequently occuring from Showa in late 2009. Minamidake summit craters on the other hand were largely degassing and only sporadically (less than once a month) explosively active in 2009. Over 400 eruptions were reported in 2009, for the first time in 24 years. In early 2012, even higher levels of activity were occuring. 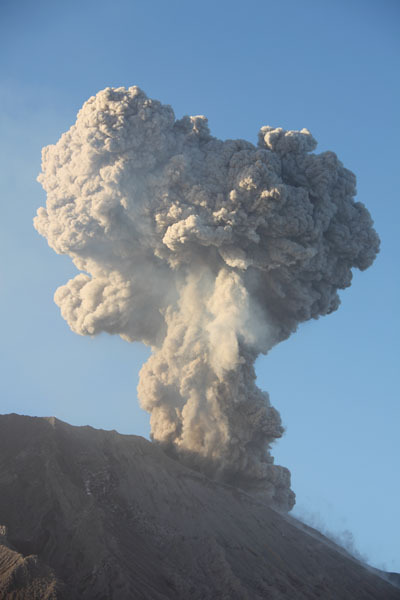 A number of publications have addressed the eruption mechanism of vulcanian explosions at Miname-dake summit crater. It has been suggested that a typical eruption cycle may commence with a moderate strombolian phase as magma rises to the top of the conduit, followed by formation of a cap by lava erupted at the end of this stage. The cap causes build-up of pressure which is eventually released violently, causing the typical vulcanian explosion. 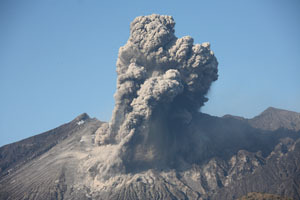 This is usually followed by a period of ash emission before the volcano enters a new cycle (see e.g. Yamanoi et al. 2008. J. Volc. Geotherm. Res. 178, p.81-93 and references therein). 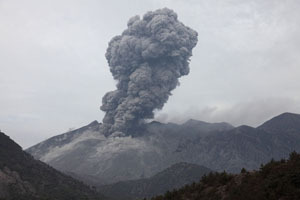 Precursory inflation of the edifice can be detected at Sakurajima anything from minutes to several hours before vulcanian eruptions. The pressure source is estimated to lie between 2 and 6km below sea-level. 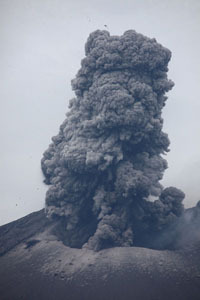 About 90 seconds before the eruption, a minor contraction commences, possibly due to gas release from the cap. This gas release results in a pressure reduction leading to outgassing of the water-saturated magma in the conduit and expansion deep in the conduit (at a depth of about 2km), expansion then extends towards the top of the conduit resulting in the blasting of the cap off the top of the conduit. The conduit then partially empties as pressure release drives powerful emission of ash (Iguchi et al. 2008. J. Volc. Geotherm. Res. 178, p.1-9). Ash emitted during the vulcanian explosions and subsequent ash venting phases can be clearly distinguished from that erupted during strombolian activity, due to the fact that the former derives from relatively degassed magma which remained near the top of the conduit for some time, whilst the latter derives from rapidly ascending magma that has had little time to degas (Yamanoi et al. 2008. J. Volc. Geotherm. Res. 178, p.81-93). As a result, vesicular ash particles are released during strombolian activity, whilst dense particles with or without vesicles are released during vulcanian, ash-venting. The vesicular particles tend to have a yellowish colouration compared to the denser particles which are slightly reddened due to ferric materials resulting from oxidation processes coating their surfaces. 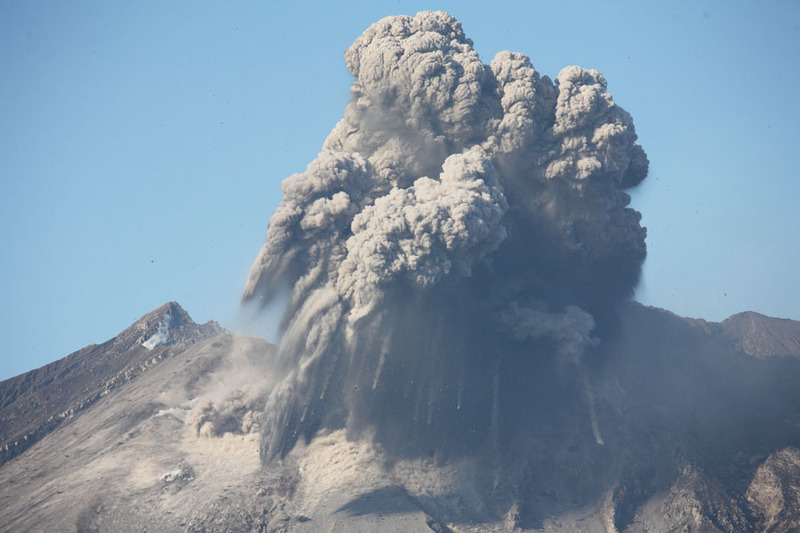 Detailed analysis of the different types of tremors associated with vulcanian activity at Sakurajima is available but too complex to be summarized herein. The interested reader may refer to e.g. Maryanto et al. 2008 (J. Volc. Geotherm. Res. 170, p.198-207) and references therein. 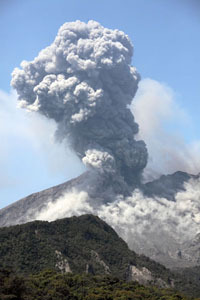 Sakurajima volcano has frequently produced eruption plumes with significant visible electrical discharges (volcanic lightning). This poses an additional danger to those closely approaching the vent. The distribution of electrical charges in volcanic plumes has been studied in detail at Sakurajima and compared to data collected at other volcanoes (Miura et al. 2002. Bull. Volc. 64, p.75-93). In general it was found that a typical volcanic plume consisted of an upper part rich in positively charged volcanic gases, a middle part with predominantly negatively charged fine ash, and a lower part rich in positively charged larger ash particles. This was designated the PNP model. 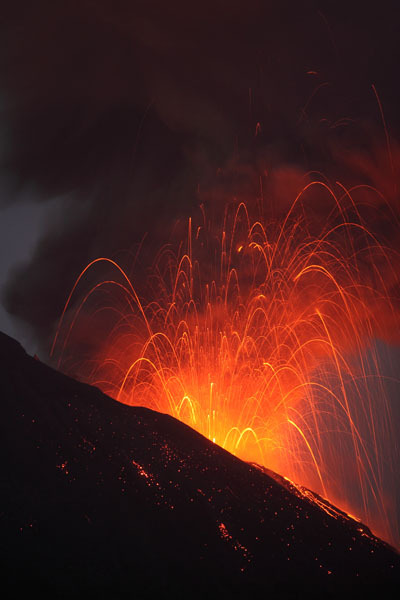 It is noted that during our observations, whilst activity appeared of similar magnitude, no lightning could be observed until the final 2 days of observation, when at least minor discharges accompanied almost every eruption (8,9 Jan). It seemed conceivable that atmospheric factors may influence the level of lightning activity. Also, most discharges were very short intracloud discharges, suggesting that even over short distances in the ash-cloud there are significant charge differences. A third visit was made to Sakurajima in February 2013, during a period of frequent explosive activity. 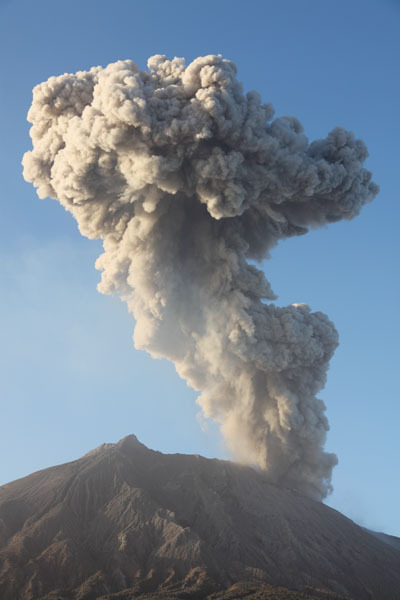 Activity was again rather irregular with long periods of sustained low level ash venting and occasional periods with often several explosive eruptions in relatively short succession. 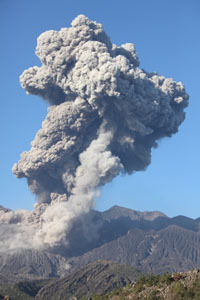 Powerful explosive eruptions are often associated with shockwaves and these are regularly observed at Sakurajima. 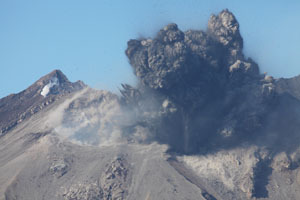 During clear dry days, the passage of shockwaves can only be heard and indirectly visibilized by remobilization of ash on the crater rim as the shockwave passes. However during moist conditions, progress of shockwaves can be observed due to transient atmospheric condensation. This phenomena results from the temporary drop in temperature as a result of reduced pressure in the area behind the shock wave front. When the air is near its saturation point for water at a given temperature, a small drop in temperature will cause condensation (as the amount of water that air can contain in vapor form is related to temperature) which can then be easily observed visually. The condensation cloud is related to the Prandtl-Glauart Singularity. Kita-dake summit crater remains inactive yet is nevertheless included in the exclusion zone which extends 2 km from each of the summit craters (situation 2013). The flanks are extensively eroded as can be seen from the images below. 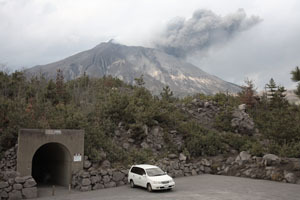 Since the major eruptions of 1914-1915 and 1946, no lava flows or significant pyroclastic flows have been observed at Sakurajima. Nevertheless, since the renewed onset of explosive activity in 1955, the volcano has negatively affected the local population in a number of ways (see SGVP monthly reports). 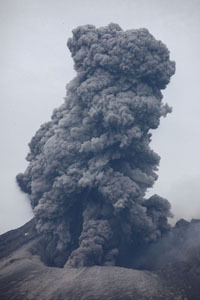 Following larger eruptive events, several cm of ash have fallen on local communities, causing damage to crops and traffic disruption. Wet volcanic ash has caused shortcircuiting of the electricity grid in May 1980. 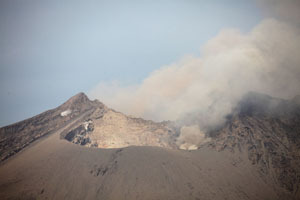 Volcanic gases creeping down the flanks of the volcano have been reported to damage crops on several occasions as has acid rain related to the volcano. 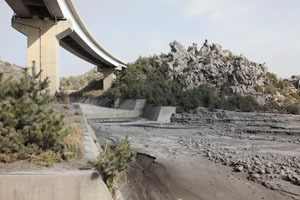 Debris flows have sporadically caused property damage and disrupted road connections although they are largely contained by the Sabo systems (see section below). Nevertheless, in 1974, a mud-flow caused 8 fatalities (Watanabe and Ikeya 1981. Erosion and Sediment Transport measurement. IAHS Publ. No.133, p.245-256). Between the mid-1970s and mid-80s, Sakurajima frequently displayed powerful explosive activity. This resulted in damage due to ballistics and also as a result of the powerful shock-waves associated with major Vulcanian Explosions. Shock-waves have been reported to break windows on many occasions during this period. 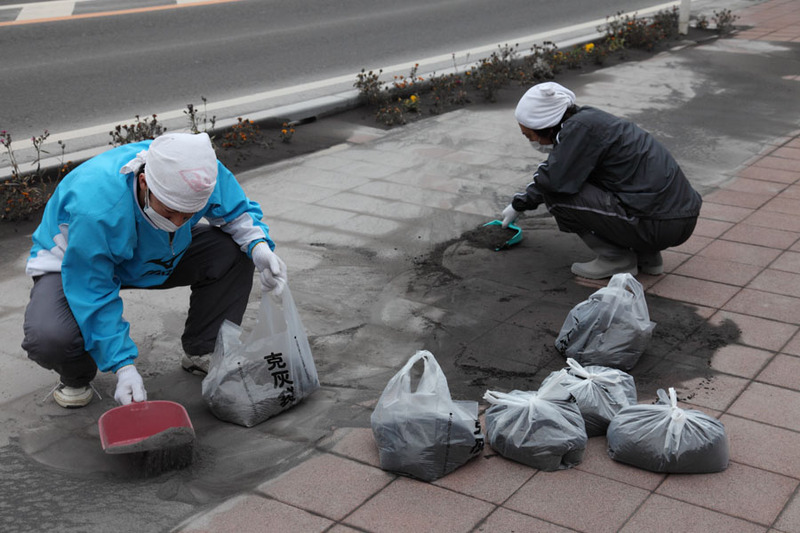 For example, 162 windows were broken as far away as Tarumizu City (10km SE of the crater) on 17.05.76, and on 03.12.85, 188 windows were reported broken in Kagoshima, 10km to the west. Several cm long ballistics fell on populated areas numerous times, causing damage to the windshields of cars and roof tiles in particular. An intense fall of hot ash and lapilli slightly burned a worker 2km from the volcano in 1983 and roofs were damaged and singed on the S flank on 21.07.84 by a similar event. Forest fires have also frequently been reported following major eruptions of incandescent materials. More significant sized ballistics have also been reported. 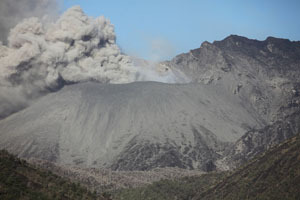 For example, in 1985/86 large craters (some over 1m wide) were frequently caused in farmland on the flanks of the volcano. 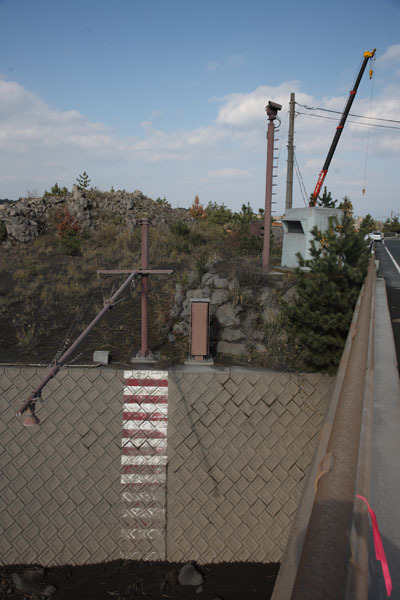 The immense power of the eruptions was most impressively demonstrated when on 23.11.06, a 5000 kg volcanic bomb broke through the concrete roof and ground floor of a hotel building on the S coast, 3 km from the crater, injuring 5 people. Nevertheless, a large number of people inhabit the lower slopes of the volcano. Concrete shelters are found in numerous places around the island and should afford protection against ballistics. Further, the fire-brigade patrols around the island during active phases, presumably monitoring the island for forest fires. The roads are regularly cleaned and ash may be bagged and brought to collection sites which are spread around Sakurajima peninsula and also can be found in Kagoshima city. 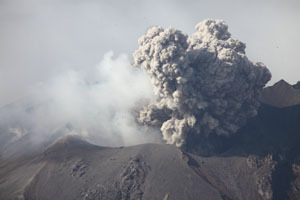 Eruptive activity has also affected air traffic from nearby Kagoshima airport. Plane windshields have been broken by large lapilli on several occasions in the past, although no major incident has occurred. The situation is constantly monitored with ash advisories being released if ash is likely to reach commercial airspace. The impact of long-term ash exposure on the health of the local population has been studied in detail. A recent study which focusses on the mineralogy of the ash and its relation to any effects, also provides a comprehensive summary of previous data (Hillman et al. 2012. Bull. 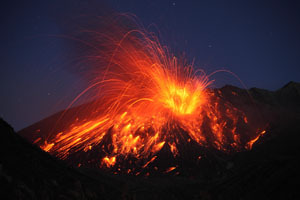 Volcanol. 74, p.913-930). Cristabolite levels, a crystalline form of silica which may cause long-term damage to the respiratory system, was present only at low levels. 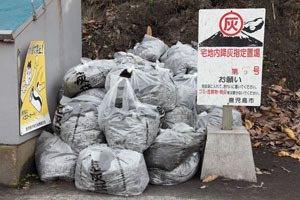 No fibrous particles were seen and the ash had low reactivity in toxicological tests. 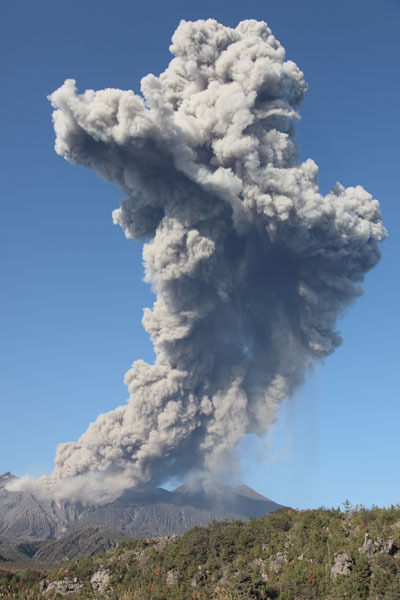 According to a previous study, it is possible to cause Bronchitis in test rats, although the levels of ash administered far surpassed those experienced by humans around the volcano. However, epidemiological studies (Higuchi and Akiba 2012. Med. J. Kagoshima Univ. 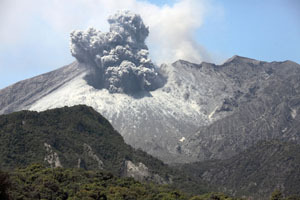 63(3), p.43-58) suggest that levels of lung cancer in Sakurajima town at the base of the volcano were over 50% higher during the 1968-2002 period than in the city of Kanoya (30 km from Sakurajima) which is not significantly exposed to ash from Sakurajima. Some earlier studies also showed epidemiological evidence for an effect of the volcano on respiratory illnesses (For details see Table 1 of Hillman et al. 2012). 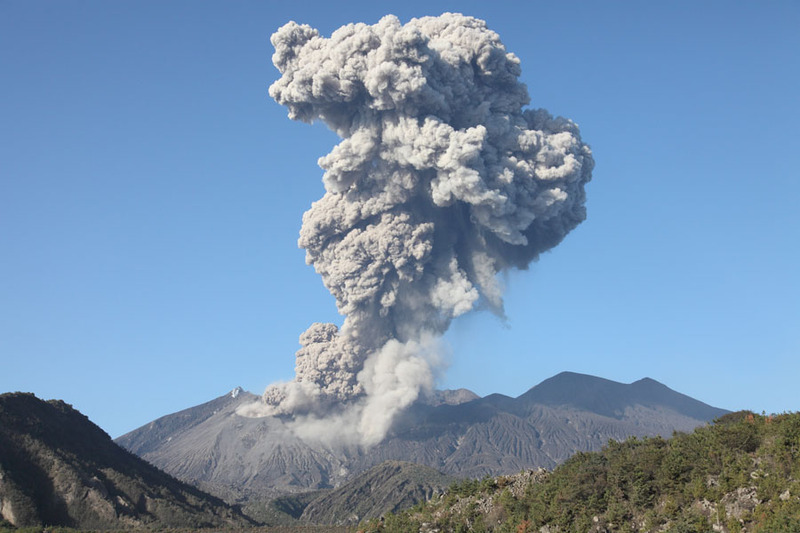 Some negative effects may be attributable to volcanic gases, since sulphur dioxide levels could also be correlated to mortality fluctuations on a week to week basis in one study. A series of large calderas has been recognized in Kyushu region, including from N to S, the Aso, Aira, Ata and Kikai calderas. These, and several further putative calderas have been recognized based on geological studies combined with studies of gravitational anomalies, attributable to the less dense rock that gradually fills calderas subsequent to their formation. 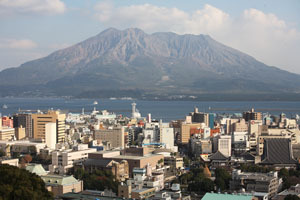 Kagoshima bay is essentially formed by the Aira caldera at its northern end, the Ata caldera near its entrance, and a number of further depressions in between. The bathymetry of the bay and its subsurface structure have been extensively documented (Yokoyama and Ohkawa 1986. J. Volc. Geotherm Res. 30, p.253-282). Gravitational data suggest that the Aira caldera is an essentially funnel-shaped depression with a depth of about 4km. Most of the caldera is filled with fall-back materials from the original eruption as well as materials from subsequent eruptions and other sediments, with the center of the bay only having a depth of just over 100m at present. In the NE corner of the caldera, a structure known as the Wakimako subcaldera is found, with a diameter of about 6km and a flat bottom at a depth of about 190m. Submarine fumaroles are still active at a small cone on its floor. 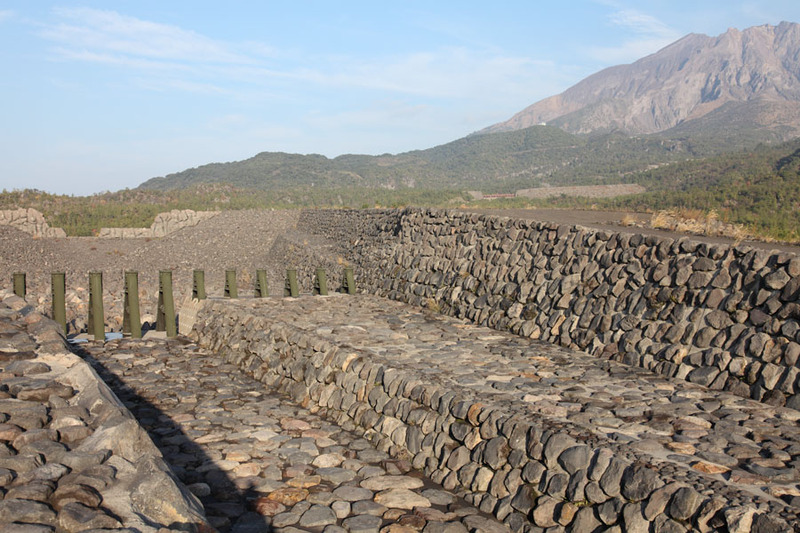 This caldera may be linked to the subaqueous eruption of the Shinjima Pumice, named after it became exposed subaerially on Shinjima island, north of Sakurajima, when this was formed as a result of uplifting associated with the 1779 eruption. This pumice, presumably erupted several thousand years ago, forms a 40m thick layer on much of the caldera floor (Kano et al. 1996. J. Volc. Geotherm. Res. 71, p.187-206). The massive eruption leading to the formation of the Aira Caldera resulted in deposition of over 400 cubic km of largely ash and pumice, equivalent to over 100 cubic km of rhyolitic magma. 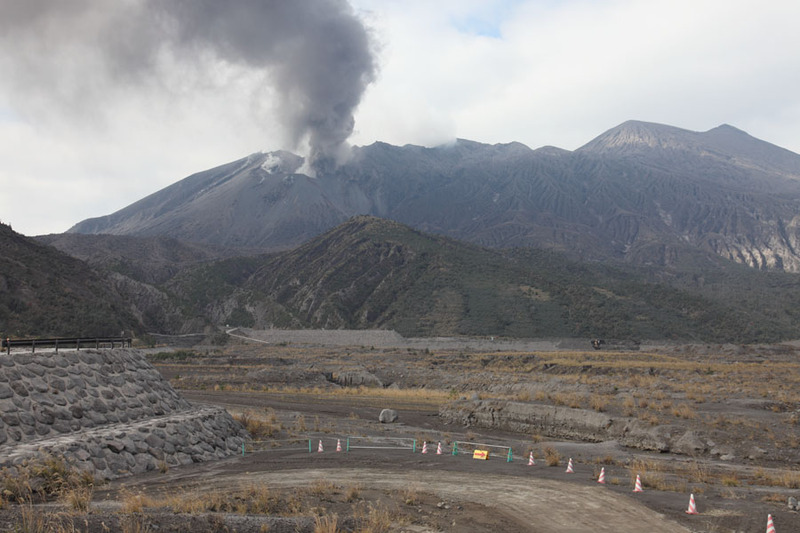 The first deposits, in order of emplacement, are the Osumi pumice (98 km3) and Tsumaya pyroclastic flow (13km3). Both were probably sourced from a vent at the site of present day Sakurajima. These deposits were followed by materials from a vent in the center of the caldera, starting with the small Kamewarizaka breccia layer, and followed by the massive Ito PF (300 km3) and Aira-Tanzawa co-ignimbrite ash deposits, both probably erupted during the caldera-forming stage of the eruption, during which the surrounding wall rocks progressively slumped into the central vent (Aramaki 1984. J. Geophys. Res. 89, p.8485-8501). 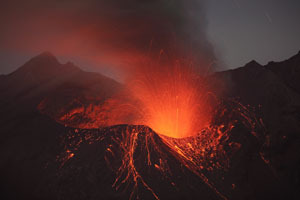 The trigger mechanism for the eruption was possibly the intrusion of a small amount of mafic magma into the bottom of a huge silicic magma body that had been responsible for eruptions in the area for the preceeding 30,000 years (Sekiguchi et al. 2007. AGU Fall Meeting Abstr. V13C-1486). 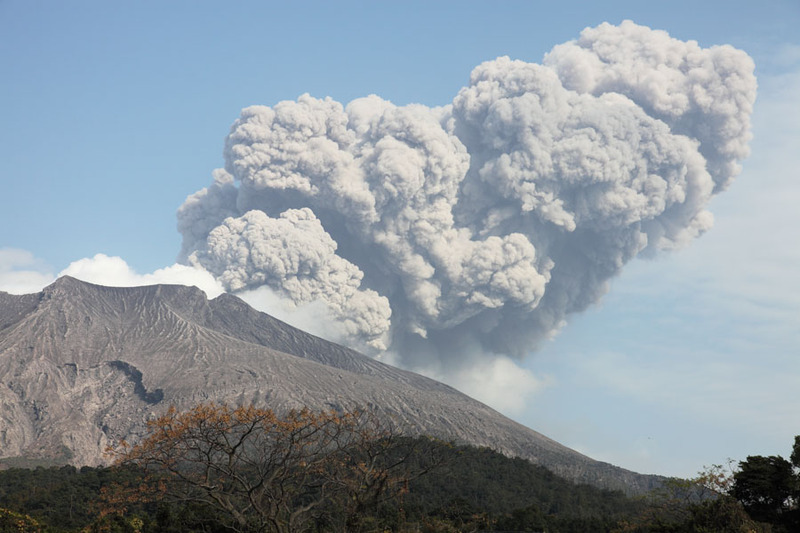 Interestingly, even older eruptates and material erupted at Sakurajima volcano are all andesitic / andesitic-basaltic, suggesting that the caldera-forming eruption involved a distinct magma body. 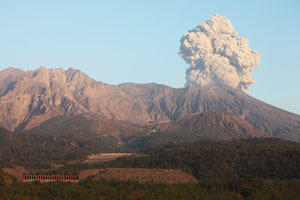 Models for the magma bodies for present-day Sakurajima and that associated with the Aira Caldera eruption have been compared, with mixing of dacitic and basaltic magmas implicated in current activity, in contrast to a large rhyolitic body primed by basaltic magma from beneath implicated in the latter (Arakawa et al. 1998. J. Volc. Geotherm Res. 80, p.179-194). 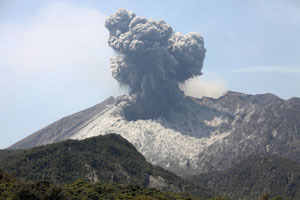 Given the different source magmas and presumably magma chambers, it is possibly questionable whether Sakurajima can rightfully be regarded as a continuation of activity at the Aira volcano, rather than a distinct volcano in the same geological complex. 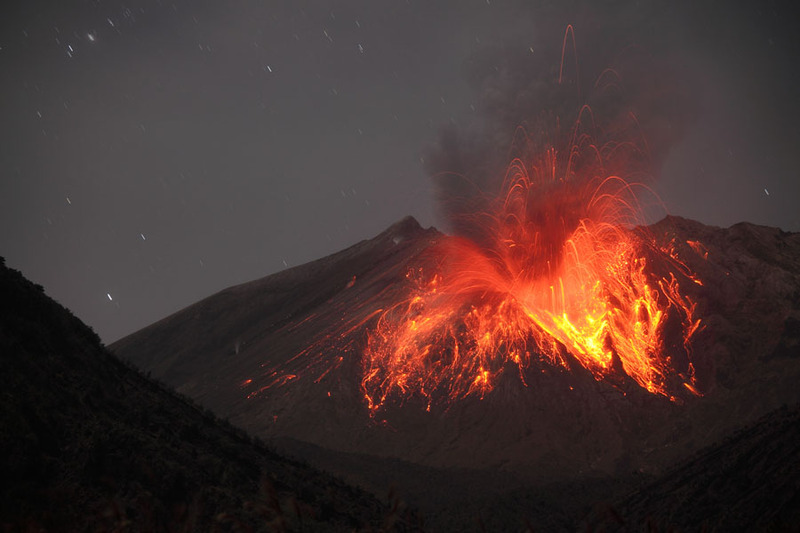 Major historical eruptions occurred in 1471-76 (Bunmei), 1779- (An-ei), 1914-15 (Taisho), and 1946 (Showa). Each of these emplaced large andesitic lava flows which reached and modified the coastline of Sakurajima. Andesite eruptates are thought to result from mixing of two source magmas in a chamber under the SW portion of the Aira caldera at a depth of 3-6 km. 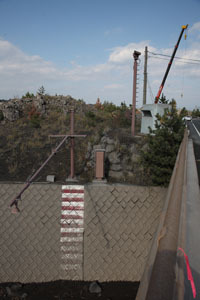 The current dacitic source is considered to lie under the center of the caldera, whilst the basaltic source lies far deeper. The composition of the lavas shows a trend towards mafic lavas with a progressive reduction in silicate levels from 66% (Bunmei) to only 59% (Showa) (Arakawa et al. 1998. J. Volc. Geotherm. Res. 80, p.179-194). The 1779 eruption was preceded by several days of violent tremors. At 11:00 on Nov. 8, first gas emissions were noted from Minami-dake summit. A violent eruption started on the south flank by 14:00 and vents on the northeast flank started too erupt by 16:00. The violent eruptions continued for about 1 day and were followed by an effusive phase resulting in extensive lava flows which reached the sea. Brief explosive reactions occurred about 10 times over the next 20 years, one occuring subaqueously and resulting in a devastating tsunami. The 1914-15 Sakurajima eruption was the most violent in Japan since historical records have been taken (see e.g. Jaggar 1924. Natl. Geogr. 45(4), p.441-470). Volcanic tremors were first felt on 10 Jan. 1914 and their frequency and intensity increased in the following days. Fortunately, this was understood as a warning of an imminent eruption and the 22,000 inhabitants of the island, largely farmers or fishermen, started to evacuate the island on the 11th using all available boats. By the 12th, the navy and steamship operators were assisting in the operation. 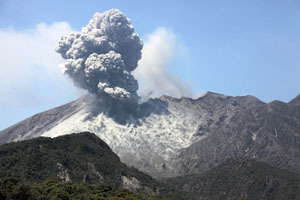 First reports of gas emissions from the volcano were made at 14:00, yet the volcano remained quiet. 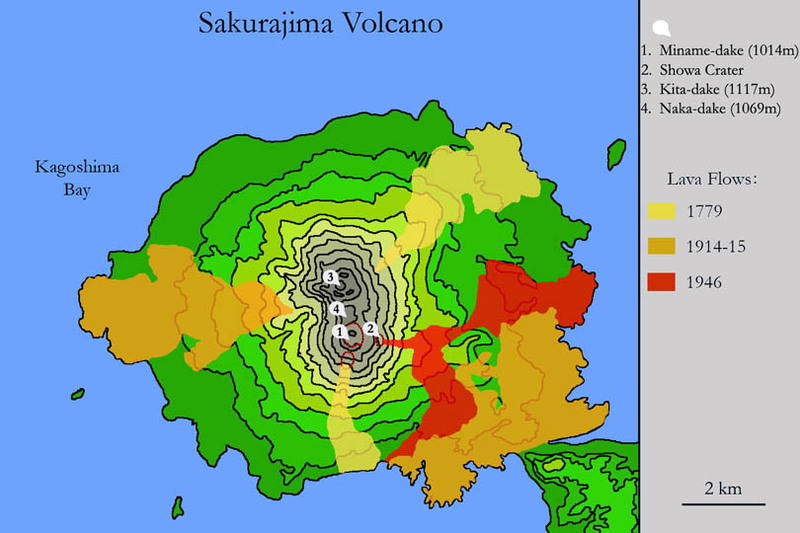 Remarkably, almost the entire population was evacuated before the onset of the eruption. The next day, at 10:05 on Jan. 12, gas emissions from Miname-dake were clearly visible. 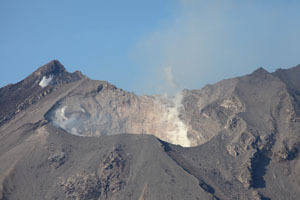 Then at 10:10, the first of a group of at least 5 vents opened on the west flank. At 10:20, the first of 6 vents opened on the east flank at a location ESE of Miname-dake. 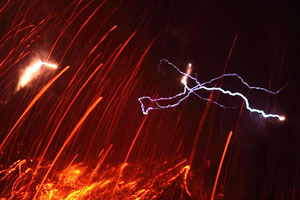 Powerful eruptions from both sites produced incandescent columns and eruption clouds reaching as high as 10km, with extensive lightning. Column collapse pyroclastic flows were observed. 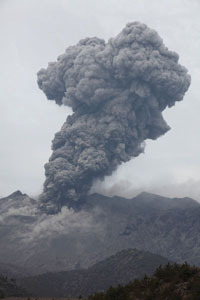 Heavy ashfall was experienced to the east with about 1m of ash falling at a distance of 20km in this direction. Due to the foregoing tremors, not only the island population had been evacuated, but also many of the 70,000 inhabitants of Kagoshima. 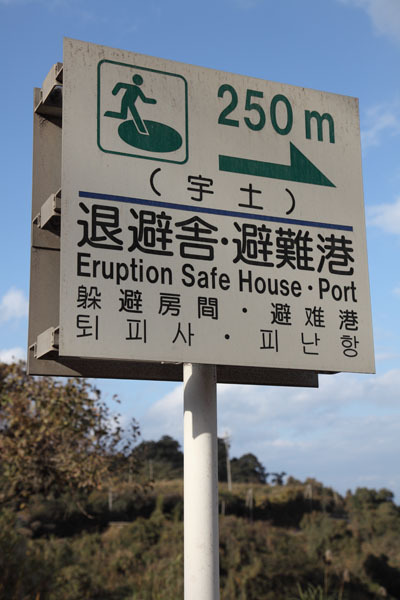 Hence, no fatalities could be directly attributed to the eruption, and only 35 people were killed, largely in Kagoshima, as a result of building collapses and landslides following a violent tremor at 18:29 on 12. Jan which reached a calculated magnitude of 6-7. A small tsunami also resulted, damaging boats in the harbour. At about 20:00 on 13 Jan., a further violent tremor marked the onset of effusive activity. Virtually all vents were involved and a large amount of lava was emplaced in 2 flow fields over the following 20 days. 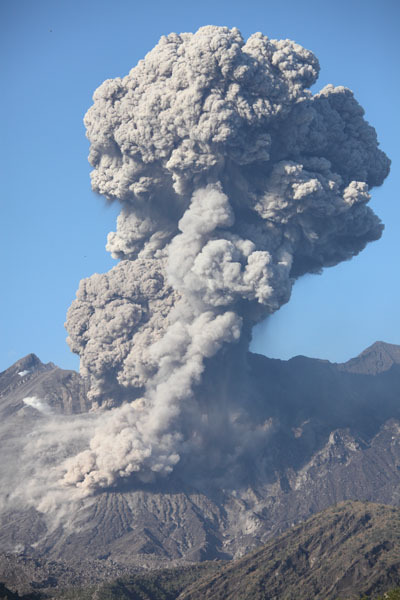 Explosive activity accompanied the effusion but was much weaker than during the climax of the eruption. This activity ceased on the west flank by 20 Jan. and effusion levels dropped, with subsequent activity largely being concentrated on the east flank. Three pairs of craters were responsable for the eastern flows. 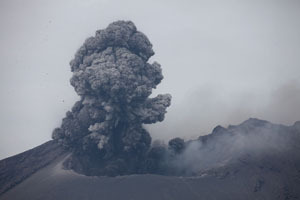 Each pair consisted of an explosively active vent and an effusive vent. The lava flowed near the vents at over 30m per hour at times, remarkably quickly for andesite, later slowing and towering up. The flows on the east flank eventually extended about 3 km from the vents, with a width in places of about 2 km. By February 1st these flows finally completely filled the 400m wide channel separating Sakurajima from Oosumi peninsula, thus connecting Sakurajima to the mainland. Effusion stopped for a while, whilst varying explosive activity continued, yet renewed effusion from the east vents was noted on 22. March 1914 and continued sporadically until early 1915. The direct impact of the eruption included the destruction of seven of the eighteen villages on Sakurajima by lava flows and the burial of many villages and farmland in a deep layer of ash, resulting in the collapse of many buildings. In total, about 2500 buildings were destroyed. Pumice rafts floating in the bay hindered navigation. In response to the eruption, the government instigated a large-scale relief operation which was one of the first in response to a volcanic eruption. 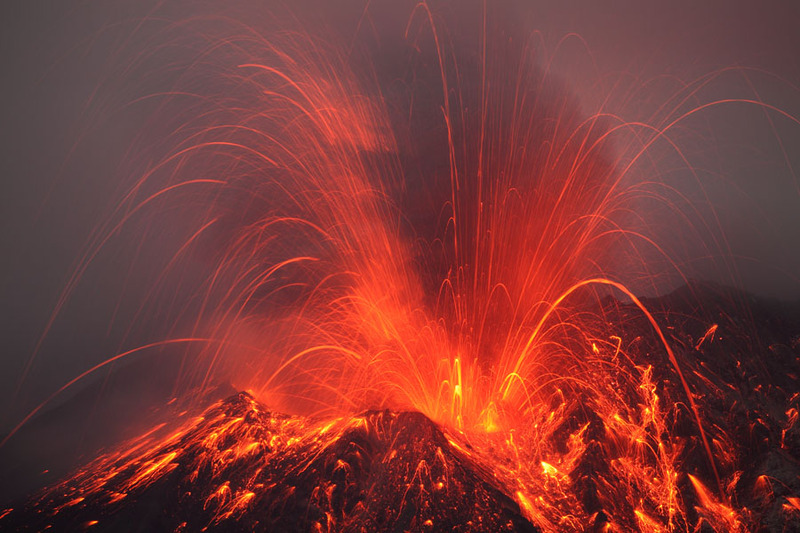 The eruption had not actually come entirely unexpectedly. Increasing seismic activity in the region had been noted, with a total of 91 earthquakes recorded in Kagoshima in 1913, compared to an annual average of about 35 in the preceding years. 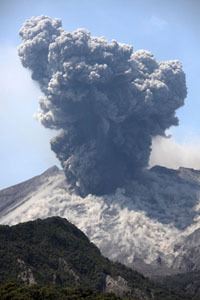 Many of the tremors were most strongly felt on Sakurajima Island. Kirishima volcano to the north had been active in late 1913. Hence, the local scientists and population were sensitized to the risk of an eruption and this fact ultimately must have saved many lives. 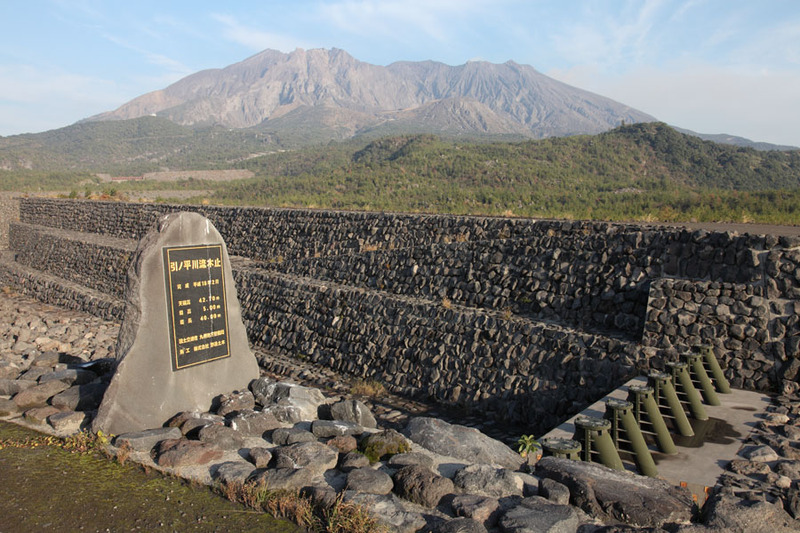 After short-lived minor explosive eruptions in 1935, 1938 and 1939, Sakurajima remained quiet until 1946, when a volume of 80 million cubic meters of lava was erupted from the Showa vent (created in 1939) at a height of 800m on the east flank of Miname-dake. 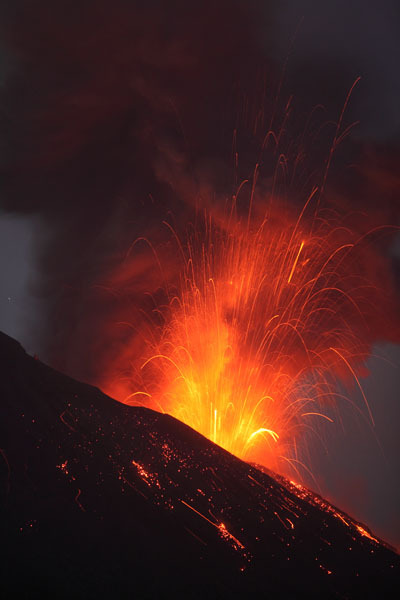 The eruption was largely effusive and no pumice was produced. 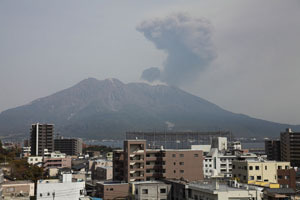 Damage was limited mainly to farmland lost to the lava flows which split and flowed to the coast on the east and south of Sakurajima. Interestingly, the central portion of the Aira caldera became depressed following the 1914 eruption, gradually recovering before the 1946 eruption after which it dropped again slightly. 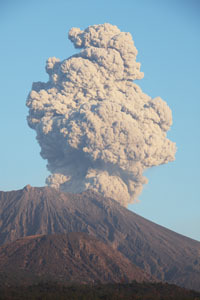 Following the 1914 eruption, a drop of about 70cm was recorded at various sites around the caldera rim and of over 2m near the northern and southern coastlines of Sakurajima. On the other hand, the ediface itself showed a minor uplifting (Yokoyama 1986. J. Volc. Geotherm. Res. 30, p.283-302). The deflation data suggests that magma was sourced (at least partially) from under the center of the caldera. 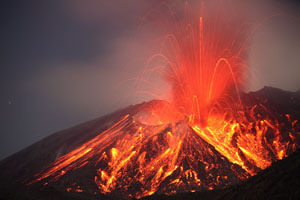 Monitoring of inflation / deflation continues and is considered one of the most reliable means for predicting the potential for larger eruptions. 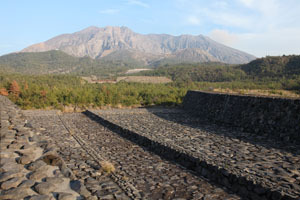 Sakurajima is surrounded by an extensive system of man-made channels and dams which serve to protect the surrounding settlements from impact by lahars (debris flows) and erosion. 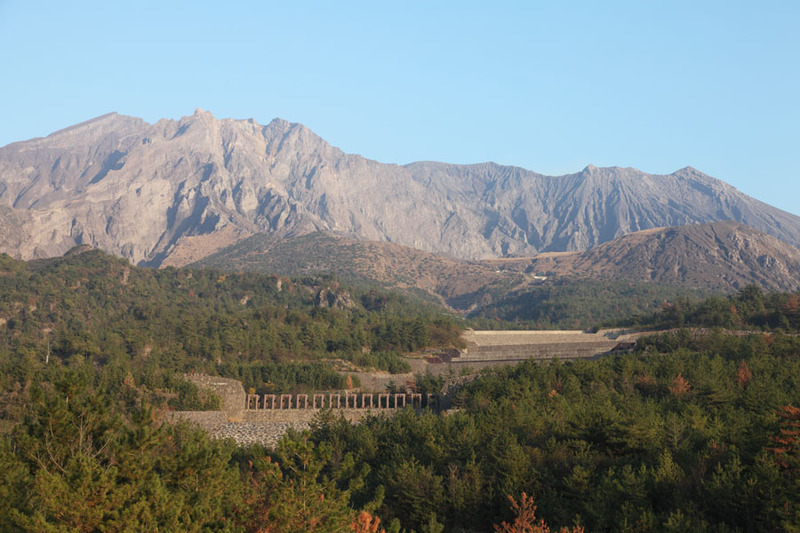 Japan is world leader in the development of such structures, which now are often generally referred to as Sabo dams (alternatively check dams or debris dams), based on the Japanese terminology for "sand protection". The Sakurajima International Volcanic Sabo Center (SIVSC) harbours both the control center and an exhibition hall detailing the large number of structures on the flanks of Sakurajima. Real-time information is gathered from a variety of monitoring devices at various points in the system. Monitors can include cameras, laser-based optical sensors, Henel Sensors (essentially pendulums hung into flow channel), vibration sensors, wire sensors (placed in flow path and disrupted if flow occurs), and ultrasonic sensors. All of these can be observed at the "Sakurajima Centralized Observation Local Station of a Debris Flow", located about 2km upstream of the Sabo center along Nojiri River. The Sabo structures control flow-off in the main drainages and include stepped channels which reduce flow-rate, simple wall structures to trap sediments, permeable dams (e.g. 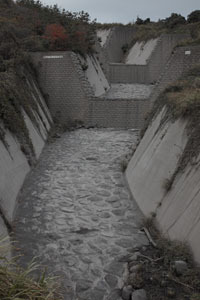 tubular grid dams) which trap large materials such as tree-trunks and boulders, and various basins which serve to collect material and reduce its flow. 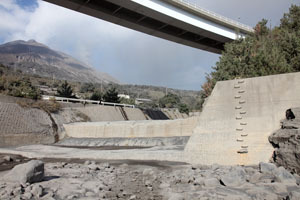 Bottom-drainage screen dams are also being tested (e.g. at Nojiri River) which are intended to withdraw the liquid component from the flows to reduce their fluidity and consequently slow them. After large lahars, sediments need to be removed from the channels to maintain their functionality. For example, up to 600,000 cubic meters of material have been removed annually from the Nojiri River Sabo system. 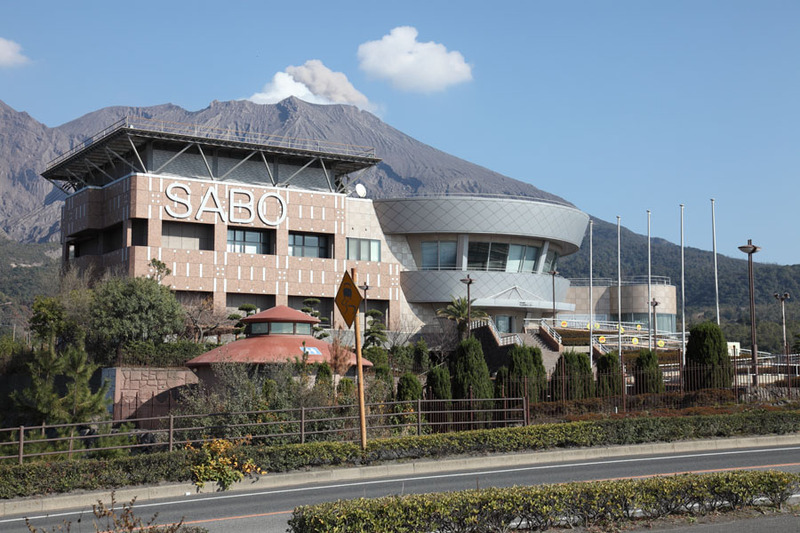 Minor Sabo projects were first initiated at Sakurajima in 1943. 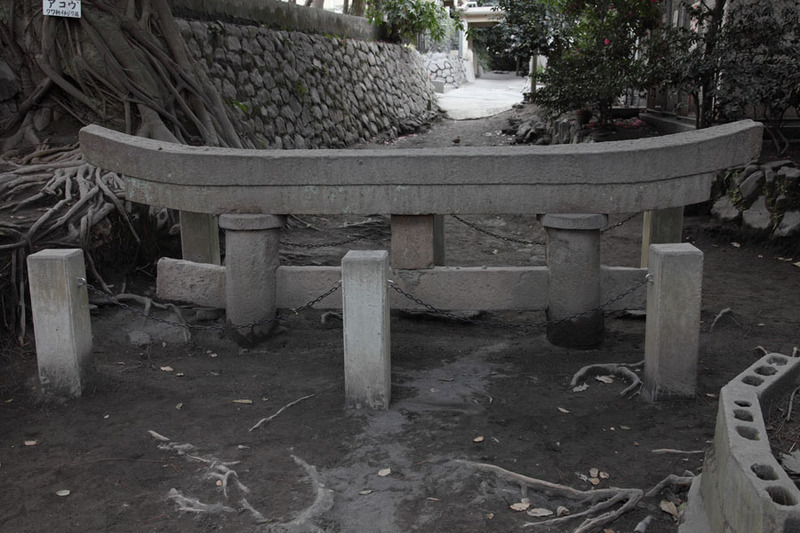 However, it was only after devastating debris flows in the early 1970s that major construction work was instigated. Starting in 1976, the Nojiri, Haramatsu, Mochiki and Kurokami rivers received extensive Sabo structures. Work at No.2 Furusato, No.1 Furusato, Arimura, Kanatoko, Hikinohira and Fukura rivers was started in 1977, 1979, 1980, 1981, 1995 and 1995, respectively (SIVSC Webpage). A further measure against erosion is reforestation. 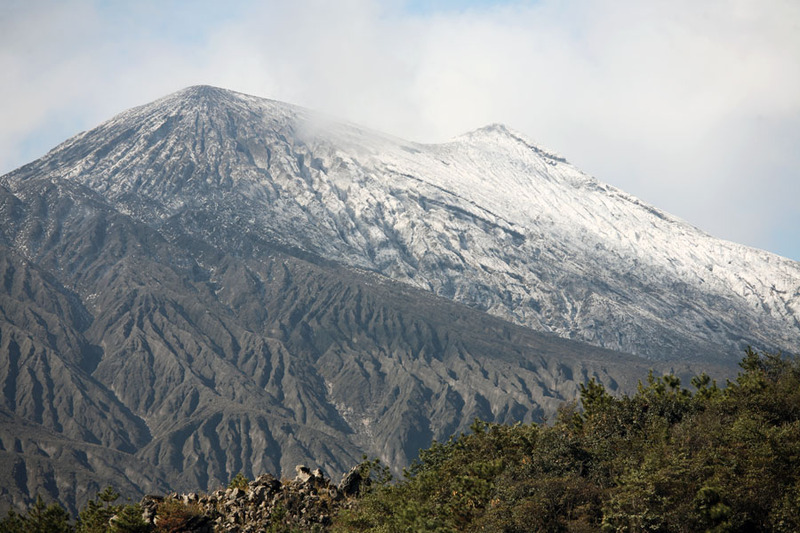 The upper flanks of the volcano are almost entirely bare of vegetation due to in part to a combination of forest fires caused by ballistics, erosion and the impact of volcanic gases. Reforestation has been tested in the Kurukami River area and included the planting of trees on the Mt. Gongen crater. Kagoshima has an International Airport and is thus easily reachable. 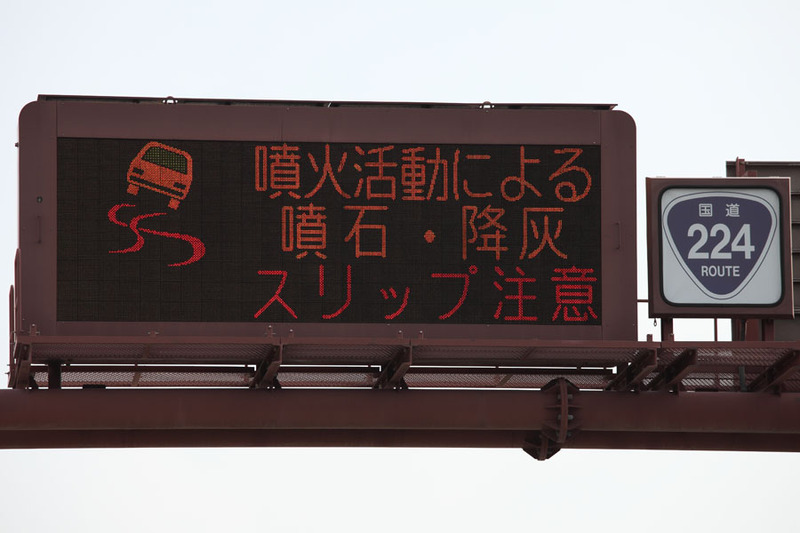 Rental cars can be obtained at the airport, although foreign or international driving licenses are not valid without an accompanying Japanese translation which must be obtained prior to ones visit. Most foreign visitors do not speak Japanese and may be surprised by the fact that very few locals speak english even at information desks, ticket offices, banks etc. However, the Japanese people I have encountered during my visits have generally been extremely helpful in trying to communicate by whatever means available and it is normally possible to work basic things out with a little patience. Fortunately, arabic numerals are used so prices are easy to see in shops. 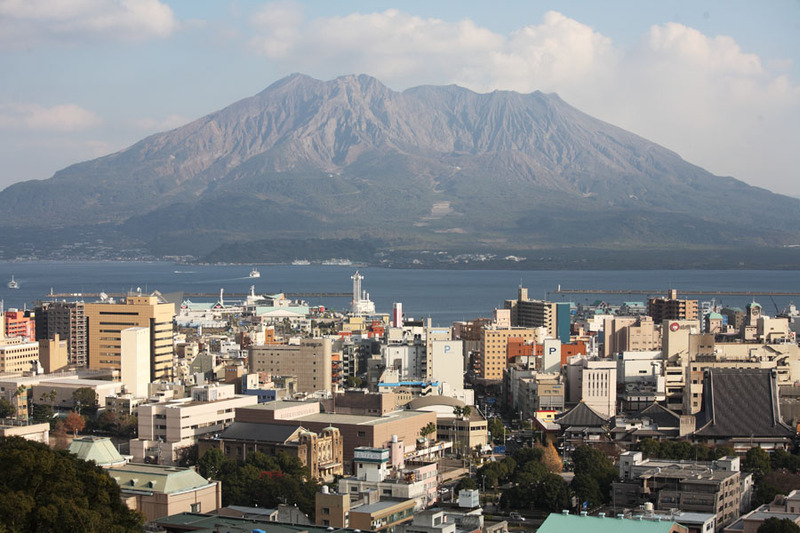 Supermarkets, small (often 24 hour) mini-markets, and restaurants can be found along most roads leading to Sakurajima. 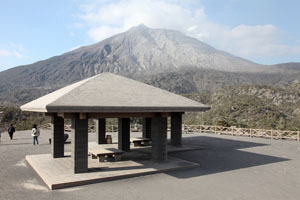 Several visitor centers or viewing points are spread around the volcano and are worth a visit and it is possible to drive all around the volcano via the coastal ring road allowing views from all angles. 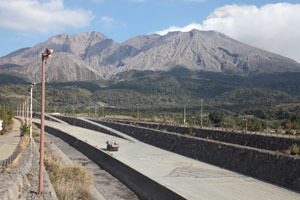 Climbing Sakurajima is forbidden and would be extremely dangerous anyway due to the steep erosion gullies on its flanks. 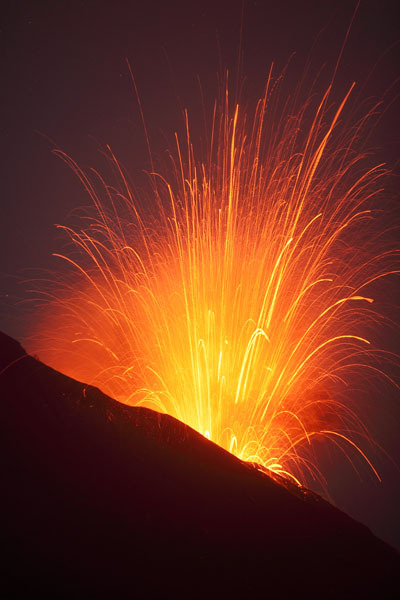 Further, volcanic bombs may land several kilometers from the active crater(s).